The results add further weight to the concept of a ‘hologenome’ – where a living organism is not viewed as an individual animal or plant but as a community: the host organism plus all of the microbes that live within it. Within this concept, host-microbe interactions play an important role in the fitness of the host, while microbiome composition may in turn be affected by host fitness. 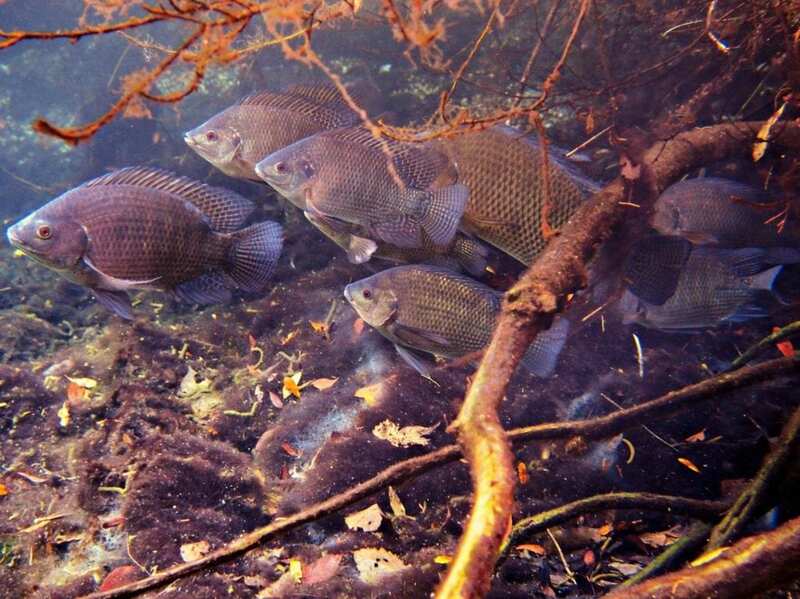 The team used the tropical fish, blue tilapia, which are normally highly sensitive to the cold, but as part of a selective breeding scheme are being bred with increased cold tolerance at the Agricultural Research Organization in Israel. This allowed comparison of the microbiomes between the cold-sensitive and cold-resistant fish, at different extremes of temperature. They first exposed 84 fish with inherited low or high tolerance to the cold to temperatures of 24°C or 12°C and analysed their gut microbiomes using genetic sequencing. They found a dramatic reduction in microbial diversity in both groups of fish exposed to the cold. This suggests that low-temperature conditions are very selective and limit the variety of microbes that can survive in the fish. Next, they looked at how the inherited temperature tolerance in the fish influences microbiome diversity. When they compared the gut microbes from the cold-sensitive and cold-resistant fish, they found that the innate temperature tolerance of the fish had a pronounced effect on the diversity of its gut microbes to begin with. They also found that the gut microbes in the fish responded differently when exposed to the cold. This led them to conclude that the host genetics has a strong effect on shaping the microbiome. The researchers next turned attention to the meaning of these changes to the microbiome. Analysis of the types of microbes that were abundant after cold exposure showed that the host tends to select microbes that are themselves tolerant to the cold. Indeed, the microbiomes of the cold-resistant fish appear to have a core group of microbes that are maintained, whereas the core group of microbes living in the cold-sensitive fish was altered dramatically after exposure to low temperatures. Finally, the team sought to understand the characteristics of the fish gut microbes that flourished in response to cold. They found that during cold exposure, the microbes tended to switch off processes that expend energy (metabolism) and turned on cell processes that were related to a stress-and-defense response. This mirrored the response seen in the genes of the fish themselves, suggesting that exposure to cold triggers a concerted energy-saving, stress-induced adaptive response that involves both the fish host and its microbiome. The paper ‘Host genetic selection for cold tolerance shapes microbiome composition and modulates its response to temperature’ can be freely accessed online at https://doi.org/10.7554/eLife.36398. Contents, including text, figures and data, are free to reuse under a CC BY 4.0 license.